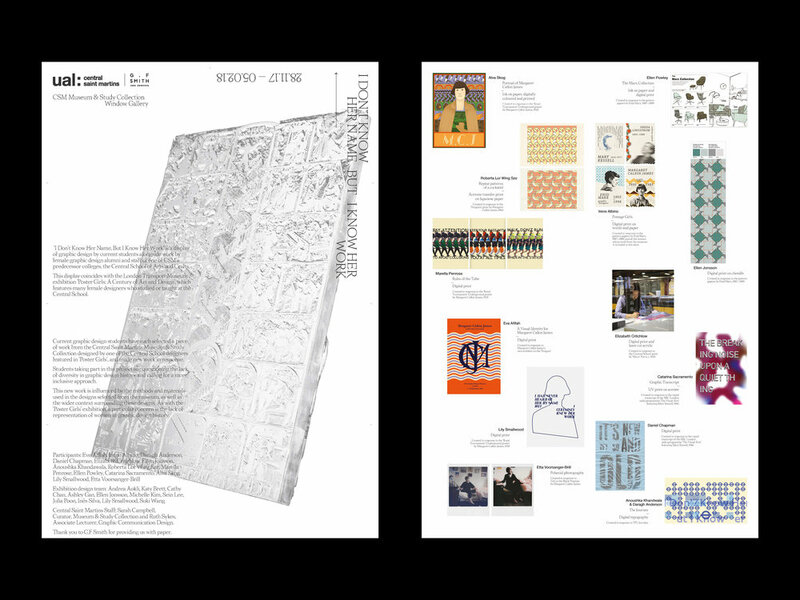 This brief was set in connection to the ‘Poster Girls’ exhibition at London Transport Museum that shows the work of over 150 female graphic artists from the 20th and 21st Century, many of which studied or taught at CSM and have work featured in the CSM museum collection . A group of students were asked to respond to one of the pieces from the collection in a contemporary way. I chose to respond to Enid Marx’ block printed papers (ca 1980). The pattern style in my piece is inspired by those, as well as the moquette textiles Marx designed for London Transport underground seats in the 30s and 40s. During her career, Marx was vocal about the pay inequality she experienced, and my work refers to the pay gap and uneven representation that exists within the graphic design industry today. Because there is an unbalance in pay between men and women, the red cross in the pattern becomes skewed. The exhibition held place at the CSM Museum & Study Collection Window Gallery between 28 November 2017 and 5 February 2018. A catalogue of the work was designed together with Lily Smallwood, Inês Silva and Ashley Gan.